As you might have heard, Rami Malek aka Mr. Robot‘s Elliot Alderson slipped right past Sacha Baron Cohen to take over the role of Freddie Mercury in Bohemian Rhapsody, thank the gods. Nothing against Cohen; I just can’t take him seriously. 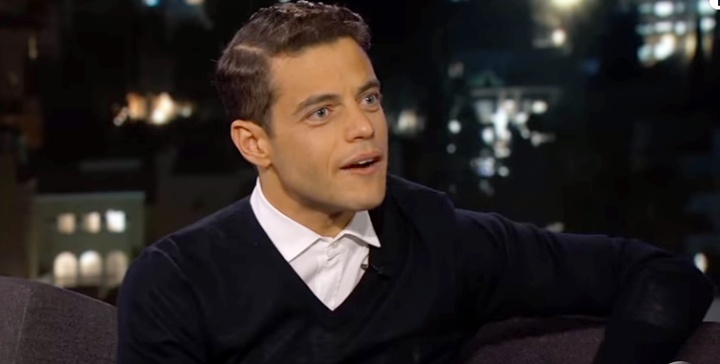 Appearing on Jimmy Kimmel Live!, Malek spoke about preparing for the role and good old Jimmy whipped out a … stache, so Rami could get a feel for wearing the appropriate lip fuzz. Looks like you need a little trim there, Rami, but it could work. If you’re wondering whether Rami can sing, feast your eyes and perk your ears for his Mercurial performance of Put on a Happy Face. He’s certainly talented enough to pull it off. Bryan Singer will direct and Robert De Niro will produce Bohemian Rhapsody; filming begins in early 2017.